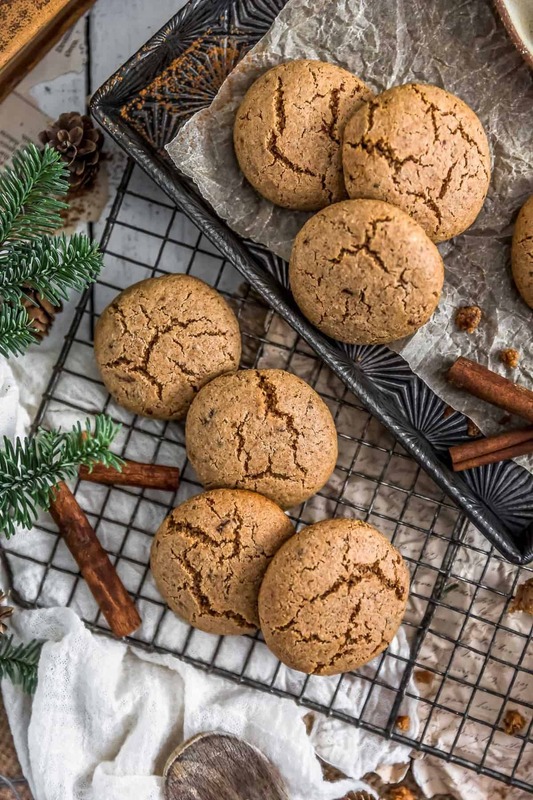 Soft and chewy, these delicious Spice Date Cookies boast a beautiful blend of cinnamon and pumpkin pie spice. 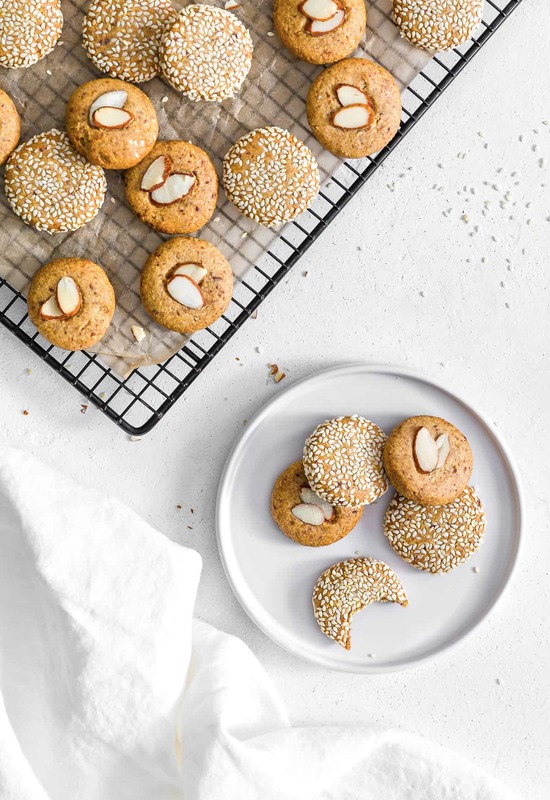 Made without any sugar, just minced Medjool dates, coupled with tahini, almond flour, and just a few other simple ingredients making them a delicious, healthy cookie. Perfectly oven baked into tiny treasures of yumminess; they are sure to please everyone in the family! Whole Food Plant Based treat, no oil, no sugar, no highly processed ingredients, and gluten free. I absolutely love these cookies. 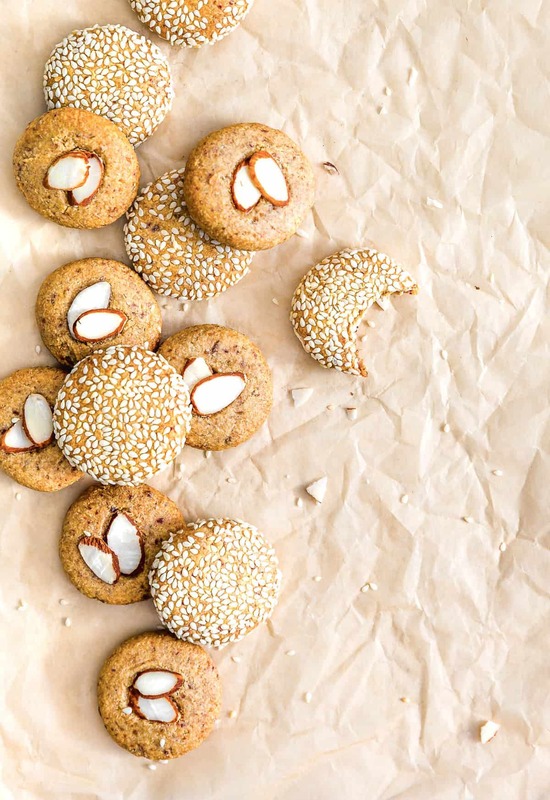 This cookie was inspired by my husband’s Middle Eastern family, where tahini cookies are very popular. 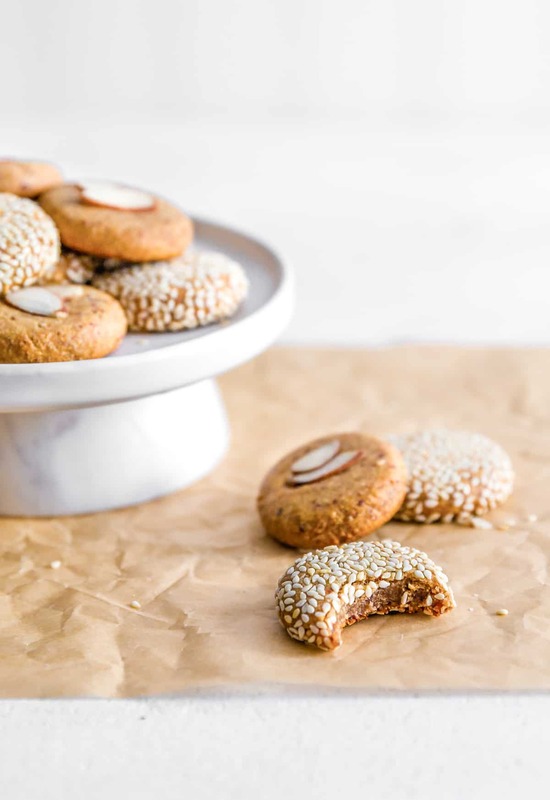 They are typically made with tahini, sugar, butter, flour with nuts or dried fruit, then rolled in sesame seeds and baked. They are SO good. In another life, I would scarf them babies down. Baking with no eggs, oil, etc., can be challenging, now couple that with gluten free and it really becomes a lot of trial and error. 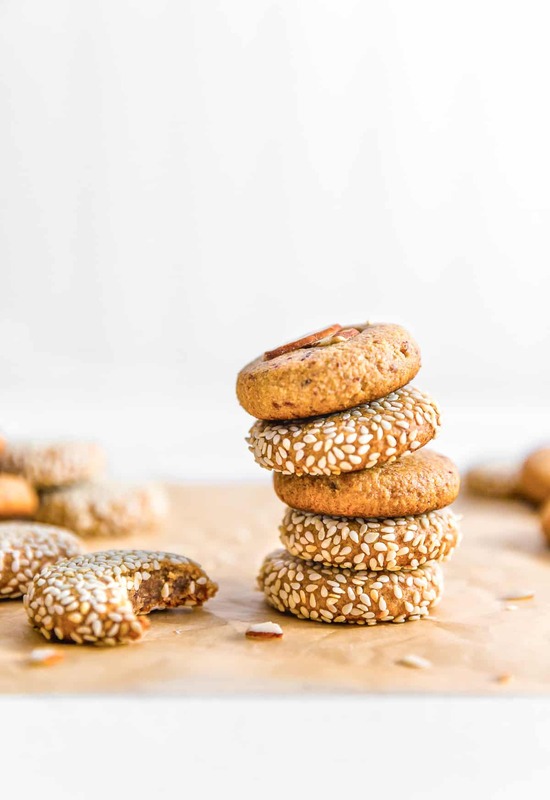 We kitchen tested these beautiful Spice Date Cookies three times in order to find that perfect combination of deliciousness as we wanted to find that balance of tahini, dates, and spice. I wasn’t really sure if the sesame seeds would work with this cookie because we changed up the spices (from the Middle Eastern version), but cinnamon and pumpkin pie spice combo totally compliments the flavor very nicely. We all fell in love with these tasty morsels. The Almond Slices also make a beautifully perfect accent on these lil lovelies. They are too cute! These cookies are so soft and chewy. I love me a soft and chewy cookie. The Medjool dates lightly sweeten the cookie. The tahini gives the cookie the substance that it needs to hold it together since there is no oil or butter used. I literally couldn’t stop eating them. They are so good. I see a lot of variations of this cookie in the near future. It is the perfect Whole Food Plant Based cookie because it hits the trifecta of deliciousness, soft & chewy mouthfeel, and it is healthy! One time I was gifted with a plate of authentic Middle Eastern tahini cookies after bellydancing at a Lebanese graduation party several years ago. I will never forget that gig. The cookies were delicious and I distinctly remember them; however, it was what happened at the party that is memorable. When a potential client calls about a bellydance gig in the summer months, I always forget to ask if the gig is outdoors as a lot of people have summer parties outside. Bellydancing in 90 degree weather can be challenging for several reasons. First, bellydancing is like running at top speed for 15-20 minutes nonstop, using every muscle in your body while trying to make it look fun, graceful, and effortless. It is a lot harder than it looks, and that is the beauty of bellydance. Second, my hair is the absolute worst in hot, humid weather. It has a life of its own. So at this particular party because it was an outdoor gig. It was around 98 degrees and the humidity was high. It was so hot that day that I literally felt like I was breathing water. I had anticipated that my hair was going be a little bit crazy, but I just had no real idea how insane it would become. When I started dancing, I literally could feel my hair growing and growing and growing. The longer I danced the more bushy and frizzy it became. I couldn’t see myself, but I could see it in the audience’s faces. My mom often accompanies me to gigs and holds my zills (finger cymbals), veil, candle tray, and other props for me. She calls herself “Ameera’s Prop Assistant”. But, in reality, she says, she just loves to watch me dance. She really is super helpful though. I couldn’t dance without her keeping me organized. Once I got done dancing, sometimes people want pictures with me for their memory books. Here’s me pouring sweat from every pore in my body and my hair is literally sticking wildly straight out. I am sure that I must have looked a fright. So, this small group of little girls want a picture with me and one of them says “Ewwwwww, you are really sweaty and your hair looks really messy! Do you need a brush?” All I could do was laugh. Once I got back inside the house to change, I saw myself in the mirror and I couldn’t believe how crazy I looked. My hair was completely wild, insane, and sticking straight out all over. My bangs were sticking straight out and curling. I looked utterly ridiculous. OMG, I will never forget that gig. Monkey’s hair looked like Monica’s from the Friends episode where Monica’s hair keeps growing and growing and gets frizzier and frizzier from the humidity. By the time Monkey got done dancing, her hair was pure insanity just like Monica’s. It was quite comical. No hair products can tame that hair when it is humid. LOL It has a life of its own. The lovely hostess sent us home with a plate full of tahini cookies. 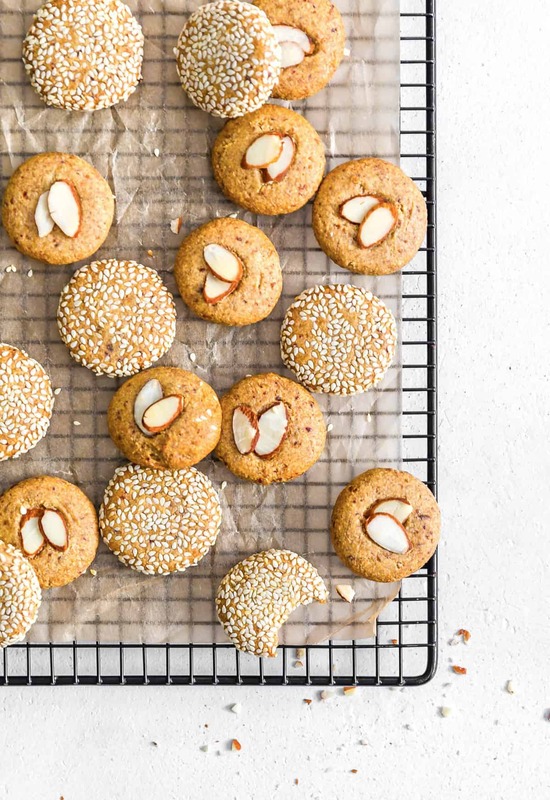 It’s been years since I had an authentic Middle Eastern tahini cookie, but it sure was fun creating this healthier one. 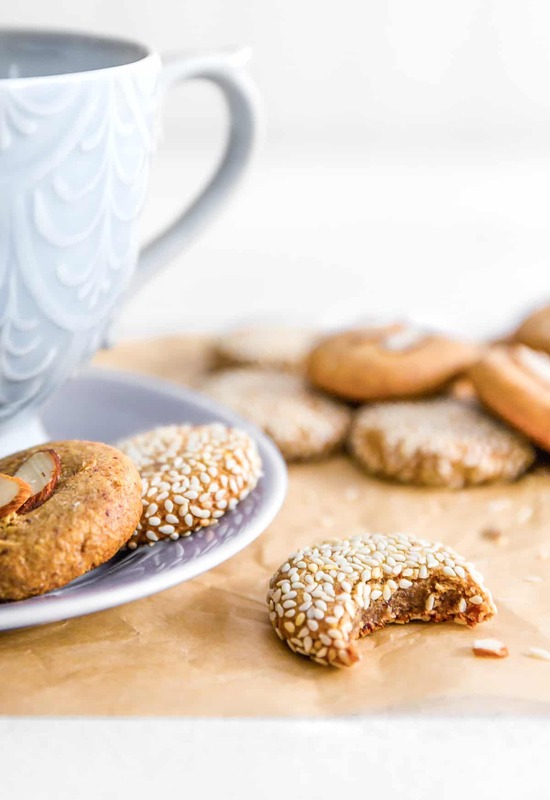 These spice date cookies are a version of the original tahini cookie, but a lot healthier and super tasty. I love them!!! We hope you give them a try. They are super yummy! Place the Medjool dates into a food processor with the tahini and process until the dates are finely minced. Add all the other ingredients and process until the mixture forms a ball in the food processor. Line a baking sheet with a silicone baking mat (or parchment paper). Use a small cookie scoop (OXO Good Grips Small Stainless-Steel Cookie Scoop – diameter is approx. 1 ¼ inches) and scoop up about a tablespoon of the mixture, pressing the cookie scoop hard against the side of the bowl to compact the cookie mixture into the scooper. Then release the cookie from the scooper and hand roll into tightly formed balls and place the balls onto the silicone baking mat covered baking sheet. Makes approx. 15 to 19 cookie balls. 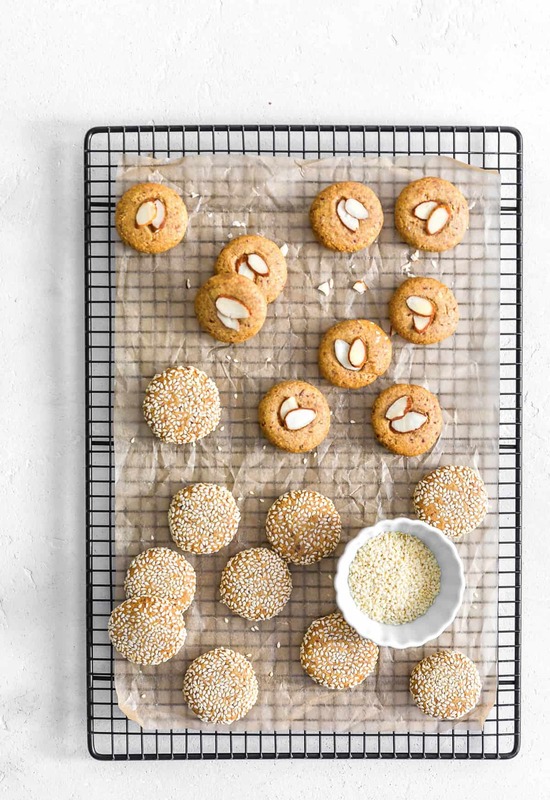 If coating the cookies with sesame seeds, roll the cookie ball lightly in small bowl of sesame seeds until completely coated, then place on the silicone baking mat covered baking sheet. Cover a small flat-bottomed glass with plastic wrap, then press down on each cookie until it is lightly flattened to about ½ inch thickness. 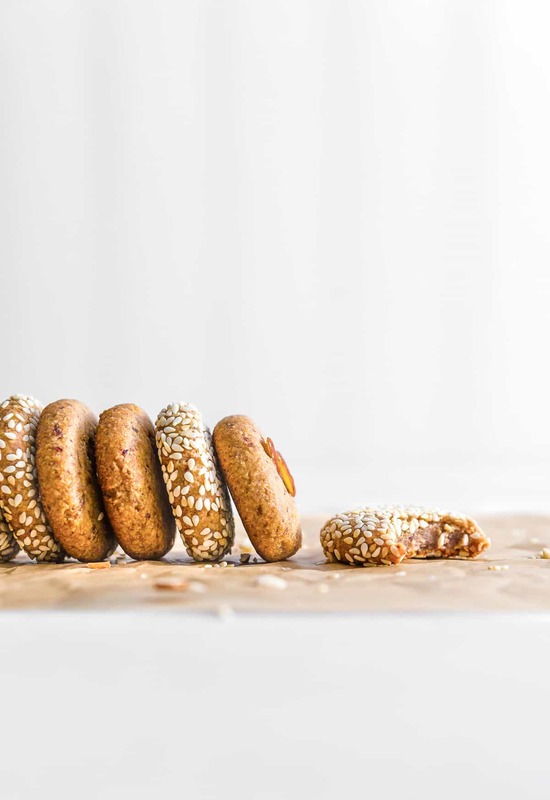 If placing almond slices on the cookies, select two almond slices per cookie and press them into the cookie with a tiny bit of pressure until they are secured. Bake at 350 F for 8 minutes, until the cookie edges firm up and are set. The cookies will puff up. Remove from the oven and gently remove each cookie from the baking sheet with a flat edged spatula and place onto a cooling rack. 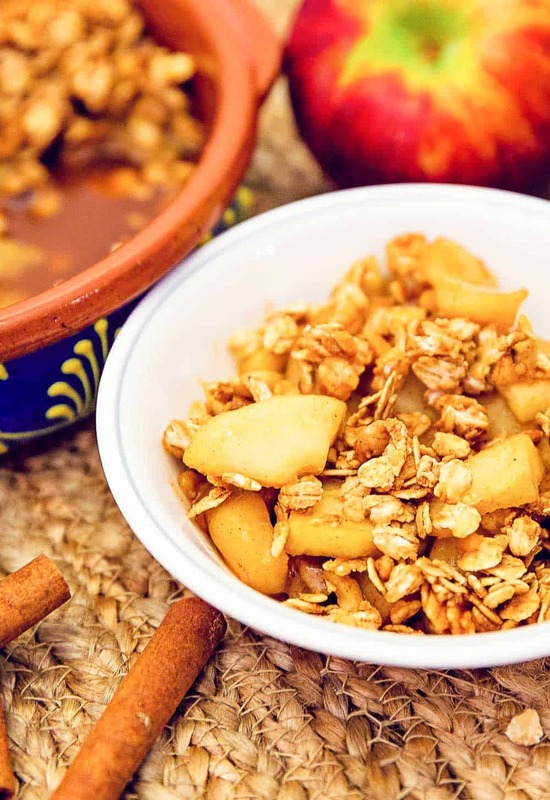 *Medjool Date: We highly recommend Bard Valley Natural Delights Medjool Dates as they are perfect for this recipe because they do not need to be presoaked. They are perfectly soft and moist enough to place directly into the food processor. If you are not using this brand of Medjool dates, you may need to presoak the dates in hot water to soften them up. Other dates simply do not work as well for this recipe. Storage: Refrigeration not required. Use within one week. Awe, you just made our day! Thank you so much for your beautiful and heart-felt comment. 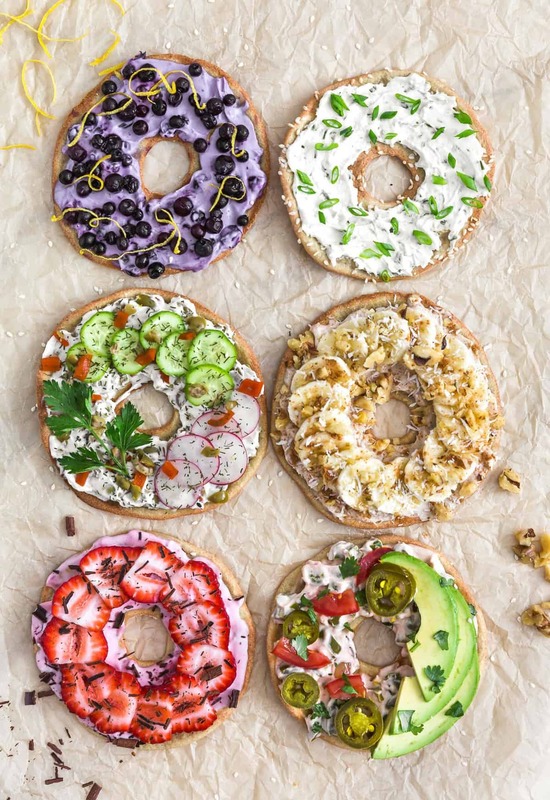 Being vegan and gluten free has its challenges, but glad our recipes can be of help. <3 We are so thrilled that you and your family enjoyed these cookies. Definitely a favorite in our home 🙂 and the German Chocolate Bars are super yummy; hope you enjoy them as much as we do! Thank you so much for connecting with us! Oh no, we are so sorry to hear this happened. Hmmm, we aren’t quite sure what went wrong. We do know that this type of cookie is denser with a chewy and moist interior because of the dates. However, it shouldn’t be raw in the middle. We make these cookies quite often and haven’t had a raw inside, but you can see by some of the close up photos that the texture on the inside is closer to a date feeling.